"Best of Both Worlds"...Bronx-Harlem's museum grade FDNY Squad 41 replica. From the steel cab steps and door hinges, to the tiny bulb detail within each light, this 1:50 scale replica emulates the real Seagrave Attacker® HD Squad 41. Our goal with each release is that our customers may notice something new each time they view the model. Authentic details replicated using over 450 hand-crafted parts. Squad 41 features impeccable detailing and true-to-scale parts that only stainless steel can provide. Fire Replicas has ushered in a new standard in 1:50 scale modeling that is sure to impress the most discriminating collectors. Only 125 units of Squad 41 have been produced. Fire Replicas are designed with the elite collector in mind, and manufactured in limited quantities to enhance long-term value. The FDNY Squad 41 measures 7.75"L x 2.5"W x 2.75"T and is securely displayed inside a custom case. The case dimensions are 12"L x 6"W x 5.25"T and the platform includes an etched stainless steel nameplate with the FDNY seal, department and truck name. 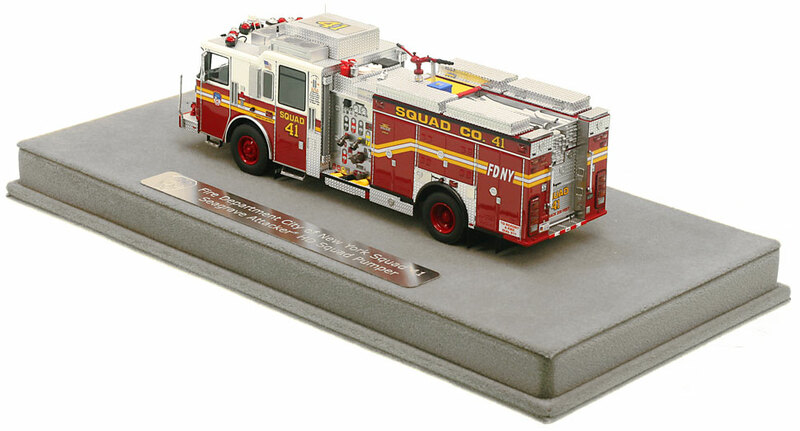 This FDNY Squad 41 scale model is a museum grade replica of the FDNY Seagrave Attacker HD® Squad Pumper. Like all Fire Replicas models, every detail is modeled to perfection and with razor sharp precision. The replica features the specific department configuration and graphics, leaving no detail overlooked. The display case is custom manufactured with high quality acrylic and resin. The stainless steel etched plate features the department and truck name, and department seal. This replica is a treasure to be displayed and admired and is in no way a toy. This Squad 41 is beautiful, quality and finish to go as usual for these minis .... single defect in my eyes for it to be perfect pump controls that are not modeling but in decals or printed ... .
Fire Repilcas has done it again with the FDNY Squad Companies!!!!!! Very detailed models, well worth the wait !!!! Wish I could afford to buy all the Squads but saving money in anticipation of other fantastic models to be produced !!!!!!!! Keep 'Em coming !!!!!!!!! Thank You !!! It seems like each new release is better than the last, and this FDNY Seagrave Squad 41 is no exception. A perfect match for the previously released FDNY Aerialscopes and Rescues. As always, the fit, finish and markings are flawless. 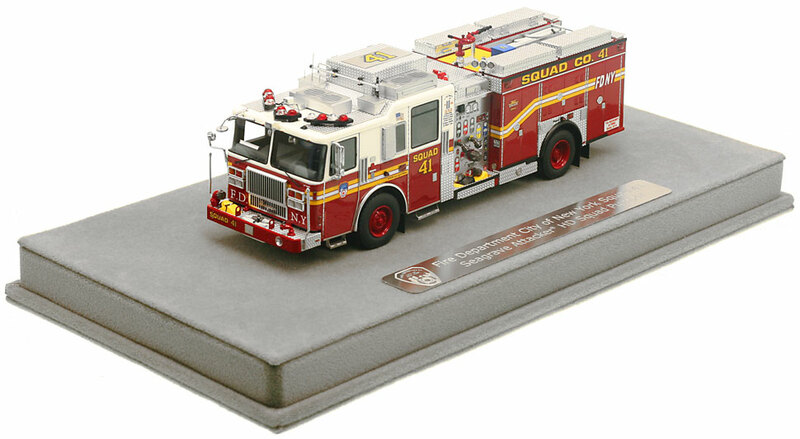 The features of the Squad units are faithfully reproduced from the stainless pump panel, to the extra storage boxes to everything else the FDNY squeeze on the actual trucks. You cannot go wrong with this awesome replica.